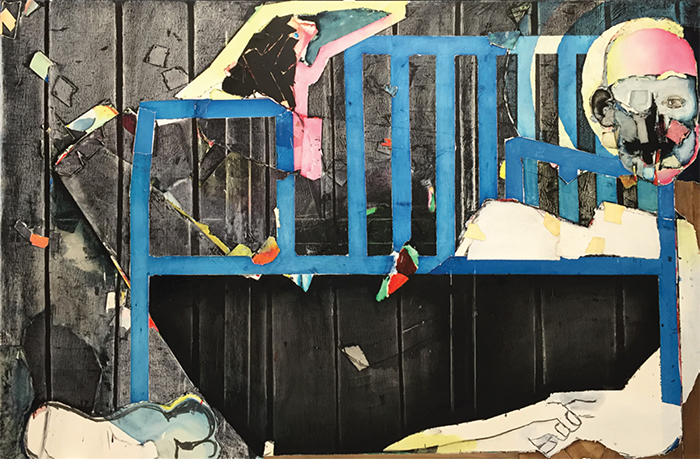 Magnus Plessen, The Blue Bench, 2015, oil on canvas, 49 1/4 × 76 3/4". First as tragedy, then as finish? Foremost slick and somewhat antiseptic, Magnus Plessen’s latest paintings, exhibited under the title “nineteen hundred fourteen,” seek to also bear historical weight. Since 2014, the artist has painted subjects meant to evoke the disfigured victims of World War I, conceiving this centennial cycle as a four-year touring exhibition, with stops, according to the press release, in “every major country involved in the first world war.” Does that include Switzerland?